GBF is partnering with CurrentCast to share information that they develop with other partners about water stewardship and sustainability in the Great Lakes and surrounding watersheds. CurrentCast is a project of the Center for Transformative Action based at Cornell University. CurrentCast content is owned by ChavoBart Digital Media, Inc. The Atkinson Center for a Sustainable Future at Cornell University provides scientific content support and reviews all editorial ideas for the initiative. 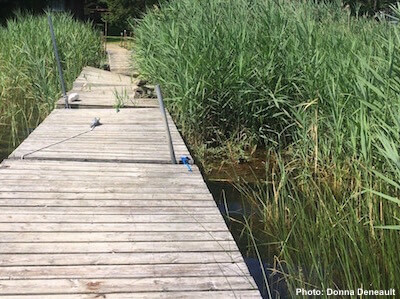 Pulling Phragmites in Georgian Bay… on this CurrentCast. Wetlands in Ontario’s Georgian Bay are threatened by an invasive grass called Phragmites that outcompetes many native species. That’s David Sweetnam of the nonprofit Georgian Bay Forever. He says in some areas, there are hundreds of Phragmites plants per square meter. So Sweetnam’s group is training volunteers to identify and remove the invasive plants by hand. Learn more.